This is not an easy question to answer. Each tracker sets their own rate, typically based on the distance they must travel. $100 is a general starting point for local tracks (within a half hour drive), and it will go up from there. Please understand that the amount we request about covers our costs each year. We maintain our dogs year round, food, vet bills , training, harnesses or tracking collars, tracking leads, lots of batteries for flashlights, and gps devices. We put fuel in our cars to come to your location, and during the off season, driving to and from training locations, which we all know is not cheap. We do this because we have a love for the outdoors, and believe that as hunters we have an ethical duty to make every attempt to recover an animal which we have taking a shot at. 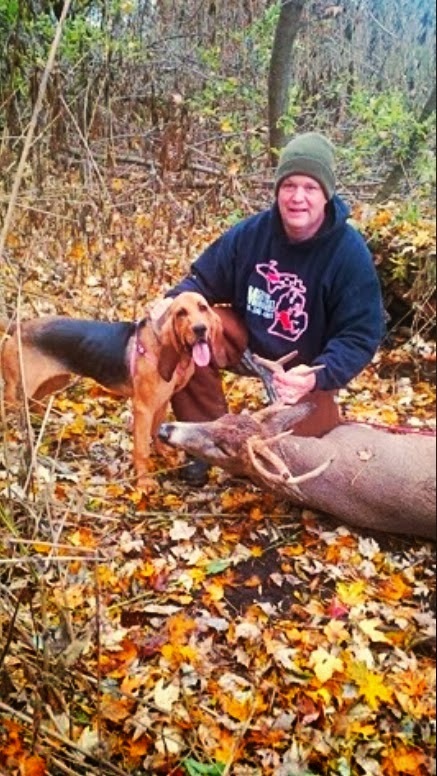 We charge a reasonable fee to help offset our costs in owning and training a tracking dog. As well to offset equipment and travel expenses. We have tried very hard to put together a collaboration of trackers in each region of the state, in order to try to get the closest tracker to you to keep costs down. Sometimes the closest tracker is not going to be the one who is available. • Do you give a guarantee? We cannot guarantee a recovery for several reasons. The deer was not mortally wounded, the track has been over contaminated by human traffic, poor scenting conditions (hot and dry) although deer are still recovered even with bad scenting conditions. We do guarantee that we are just as determined as you are to find your wounded game, and we will put ourselves through the ringer to find it. Knee deep in swamps, cut up faces and hands from the briars, banged up knees and elbows from climbing over and under logs, sweating from head to toe. WE WILL give each and every track 100% effort and follow our dogs where they take us. • How many deer do you find? The national average for recovery is approximately 33%. 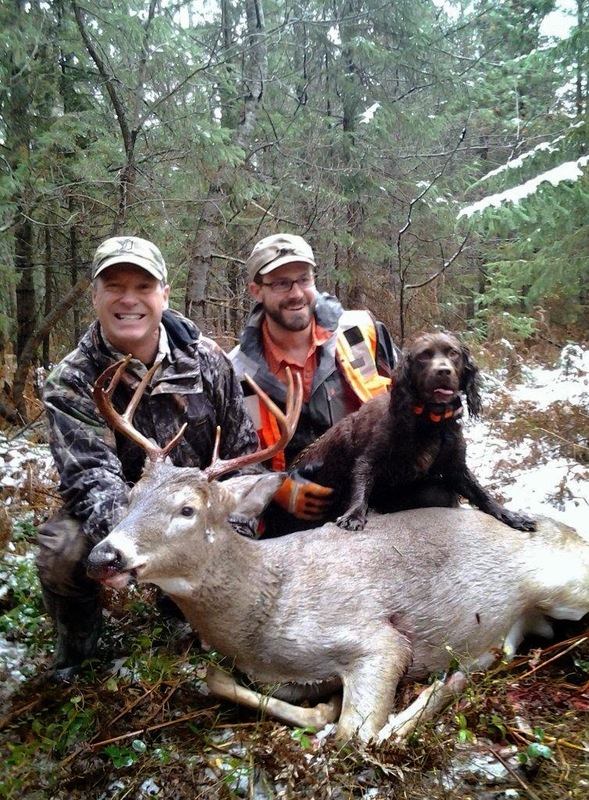 In the 2011 hunting season our trackers recovered just under 45% of the deer we tracked. Each track and each year brings new challenges, and recovery percentages fluctuate. We try our best to give you an honest opinion based on the information you provide to us on the phone of typical results from the type of shot and sign that you describe to us. • How long do you track for? Typically we recover deer in under two hours. You can expect your tracker to track for 2 hours, however if there is significant positive sign(i.e. good blood, or a visual on the deer and he appears severely wounded) your tracker will keep going. We will keep tracking until we either recover your deer or determine that the signs indicate a deer that is not mortally wounded. • How long after the shot can you track? This is another hard question to answer with any certainty. Consider that each minute, and each hour the track scent weakens and the older the track the harder it is for the dog. We prefer to be on the track as quickly as feasibly possible (given the type of hit on the animal, drive time, so on so forth). A good target is under 20 hours (12 hours or less is better), but our dogs have are trained and have been successful on tracks much older. • Can I carry my weapon while we are tracking? If your tracker is a Certified Tracker than yes you can, if your tracker is not a Certified Tracker than you are not legally permitted to carry a weapon. However, this is up to the discretion of the Tracker. There are several rules that must be followed. Your tracker can explain these rules to you. Typically we do not allow anyone to carry weapons on the track, unless your Certified Tracker dictates that the situation dictates the necessity. Usually a weapon is not needed, and it is just extra bulk for you to carry while on the track. 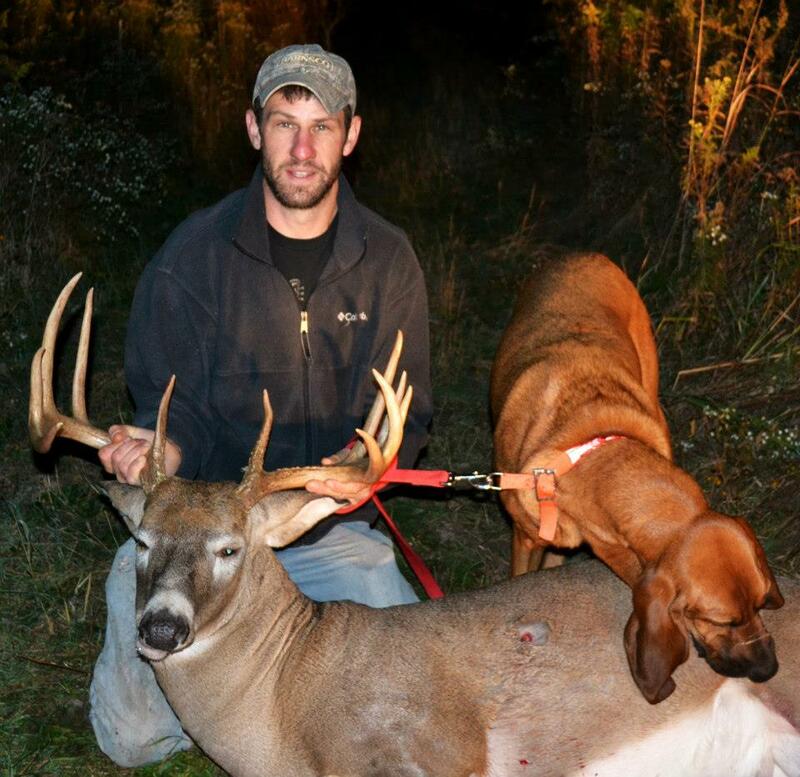 We understand that it is never easy to have an unrecovered deer, and we believe that it shouldn’t be. When a hunter has a hard time swallowing an unrecovered animal it means that hunter is an ethical hunter. • What time did you shoot the animal? • How long did you wait to look for sign? • Did you jump/push the animal? • What weapon were you using? Bow, Crossbow, Rifle, Shotgun, Muzzleloader, Pistol? • *for bow and crossbow* What broadhead? • Tree stand or on the ground? • *Tree Stand* How high up? • How far was the deer from you when you shot? • How was the deer standing in relation to you? Broadside, quartering towards/away, etc. • Where do you believe you hit the deer? Front/Middle/or Back 1/3 of the deer, Top/Middle/or bottom 1/3? We are trying to establish a grid of where the shot may have hit. • *archery* Did you recover your arrow? Leave the arrow in as it is found and mark it so the tracker can easily find and evaluate it , a lot can be determined by the type of matter on the arrow, and how it is lying in or on the ground. • What kind of sound did the impact make? • How long where you able to follow the sign? 50 yds, 100 yds, etc. • How many people assisted in tracking? • Have you already had a dog on the track? • ***Did you do a grid search? This is the biggest difficulty trackers face. While we know and understand that many deer are recovered through grid searching, it can be the most detrimental thing for a tracking dog. We are skilled at working through these areas but it makes it very difficult on a dog. Scent is on the search parties boots, and they disperse the scent vigorisly across a large area, which creates many false track lines for the dog to follow. It is best if you are considering using a tracking dog that you refrain from grid searching. While we can work past it in most cases, it does make it very very difficult.